Take a trip to 17th century Japan in Asian Diamonds, a 5 reel, 30 payline video slot from Novomatic. The highlight of this Geisha-themed game is the Free Games feature where you can win 8, 16 or 32 free spins. Play from 30p to £450 per spin on all devices including laptops, PCs, tablets and smartphones. There’s a very traditional feel to the design in Asian Diamonds. The plain mauve reels feature A to J royal values, a lotus flower and 4 ornately dressed Geisha. The best of these is the woman in pink. Potentially far more lucrative is the diamond which is the game’s wild – it substitutes for everything apart from the scatter and spins in a stacked formation meaning you can fill whole reels with wilds. Land 2, 3, 4 or 5 wilds on the same payline and you’ll win a payout equal to 0.5, 2, 10 or just over 33 times your total bet. Like the wild, the golden orb scatter spins in full stacks. These can only hit on the middle 3 reels. Land 7, 8 or 9 scatters on the same spin and you’ll pocket an award of double your stake as well as triggering the Free Games feature – you can then look forward to 8, 16 or 32 free spins. During the feature, 1 symbol will be chosen at random. This will spin in a fully stacked combination in addition to the wild and the scatter. Asian Diamonds is a very simple game. The design might not be as impressive as what you’ll find in a video slot from Quickspin or Thunderkick it’s still solid enough, especially for a Novomatic title. You’ll hear the occasional blast of traditional Japanese-style music as well as the usual bangs and bleeps backing track. The gameplay is as simple as the design. The only extra is the Free Games feature. By Novomatic standards, it’s not even that volatile. The variance here is in the medium range. 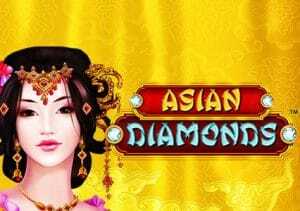 It’s not the most outlandish game you’ll find but for a simple video slot with a historical theme you won’t go too far wrong with Asian Diamonds. If you like the Japanese feel, NextGen Gaming’s Samurai Split is recommended.